Navarro Trinity — Navarro Canoe Co. Length: 13' Width: 28.5" Capacity: 430 lbs. Weight: Fiberglass-46 lbs; Kevlar-43 lbs. 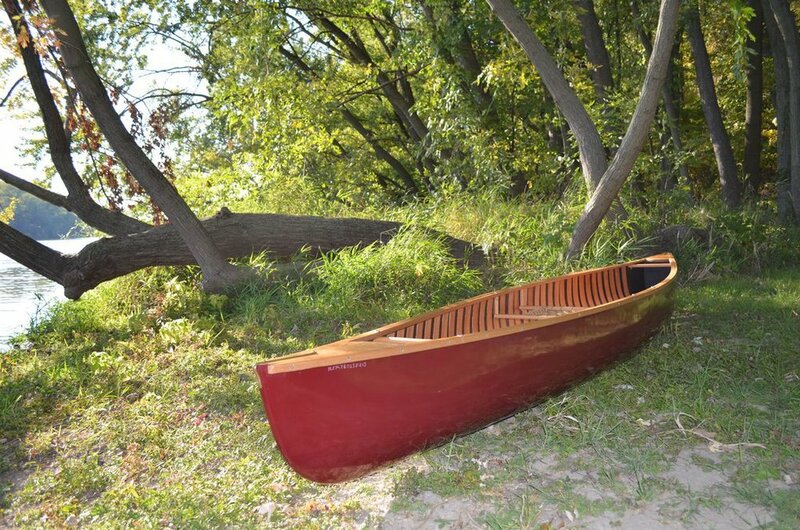 The beauty of a Navarro canoe is available for the solo paddler. The Triumph, with a three inch rocker, is great for maneuverability on twisting rivers. It features a slightly rounded bottom with a keel to offer stability for the solo paddler. It is still a speedy little boat with a smooth hull, agility, and sporty look. Its responsiveness makes it a fun recreational choice. The Triumph is easy to get in and out of and allows for great storage. Our custom fiberglass/kevlar weave produces a rigid hull that protects the cherry ribs if used in rocky conditions. Shipping based on actual cost plus $65 for packaging.